I believe every sport has many things in common, the main being hand-eye coordination along with some degree of athletic ability. The start of my ping pong season lead me to think about its relation to golf. More specifically, what can I take from my experience playing competitive ping pong and apply it to my golf game. The main thing being what I call “Planned Athletic Reaction”. Golf may be a game of inches, but table tennis is a game of millimeters (not to mention milliseconds)! If I can smash a little white pong pong ball to the far corner of the table repeatedly why should hitting a little white golf ball to a chosen point pose any more difficulty? Repetitive practice or play leads to pure athletic reaction. Table Tennis (the pro’s hate the term “ping pong”) is so fast a sport that most of my shots are “planned reaction”. The plan is to move my opponent to my left, then to my right, thus forcing the left to be wide open to a down-the-line smash to win the point. That sequence might take 2-3 seconds, so realistically I am not actually “thinking” about where to hit or put the ball, I am just “doing it”. Whether it be a 3-shot point or a 17 shot rally, I am relying on experience. I have “seen it all before”, I do not want to allow my brain to get in the way. I am just allowing my mind and body to simply “react”. For me, when I approach golf with a similar mindset I typically execute much better shots and post better scores, from tee to green. I will use putting as an example since everyone reading this has the same ability to make a 15 foot putt versus a power fade from the tee around a tree that sits 275 yards out. With that said, many of you have heard the putting tip “putt like a kid”, it is a simple way of saying putt without fear, or more importantly, without too much thought. I prefer to call it “putt with planned reaction”. 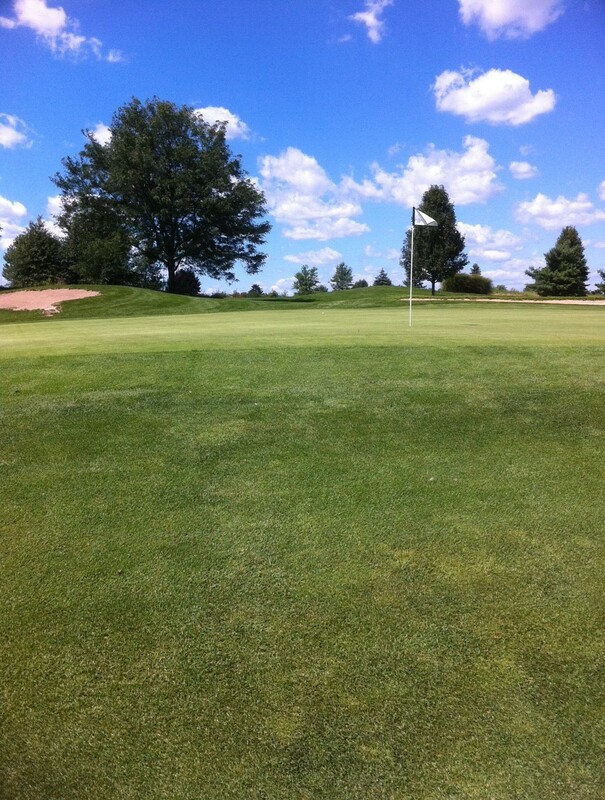 Pictured above is a 156 yard 3-wood that left me with about 20 feet. Prior to hitting that shot, at address, I cleared my mind and “just hit the dang ball”. Returning to the 15 foot putt scenario, assume your approach allowed you to see a bit of the ball’s roll as it came to rest on the green. You noticed it died a bit right to left. As you walk up to the ball and read the green (as you have countless times before), you still see the right to left line and your stance behind the ball seems to confirm that line as you feel a slight left lean. Pick your spot, address the ball and putt it out! No need to think anymore just react! You have already finished all your “thinking” in the 3-5 minutes it took you to go through the process outlined above (not to mention all the years you have been playing this game)! Golf has been said to be played in the 5 inch space between your ears. For me that is a hole with more hazards than any on this earth! I submit to you that we try to make golf a bit less cerebral and more purely physical. At the time of execution, think less and react more! Hi Jay – cracking post, and a sentiment with which I wholeheartedly concur. For quite some time, I’ve come to believe one of the main reasons we have so much difficulty is because the ball doesn’t move. I’m practicing making my routine fluid, moving seemlessly from planning to execution. I’ve always made my long game practice shots behind the ball, but made my short game & putting ones beside the ball (the rationale was distance control was more of an issue) but after having read Dave Stockton’s advice to young Mr McIlroy before the US Open, I’ve made all of my practice strokes behind the ball. This allows me to flow through my routine and stops me getting “stuck”. I’ve also resolved to trust my subconscious; while results aren’t perfect, I make fewer mistakes, and I’m much more effective at responding to & correcting what mistakes I make. You’re on the right track here Jay – keep it up! There’s a number of books which advocate this style; I’ve read & can recommend “Extraordinary Golf” & “Quantum Golf”, and “Play Golf to Learn Golf” by Mike Hebron comes highly recommended & is on my “to read” list! A great post, with insights which can only help your golf! I like your use of the term “stuck”. As it relates to my reference to Table Tennis, there is no time for getting “stuck”, physically or mentally. If you get “stuck” in either capacity, you loose the point, and there is no grey area. I don’t know that there is much difference as far as hitting any golf shot in concerned. Jay! Really enjoyed the post. Thanks for sharing with us!